I recently found these calendar numbers at the teacher store and thought they were perfect for summer. 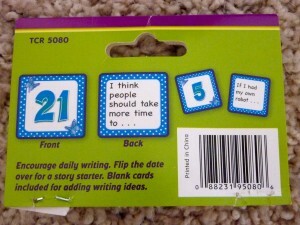 In addition to being great for working on number recognition and number order, these also include “Story Starters” on the back to encourage creative writing. 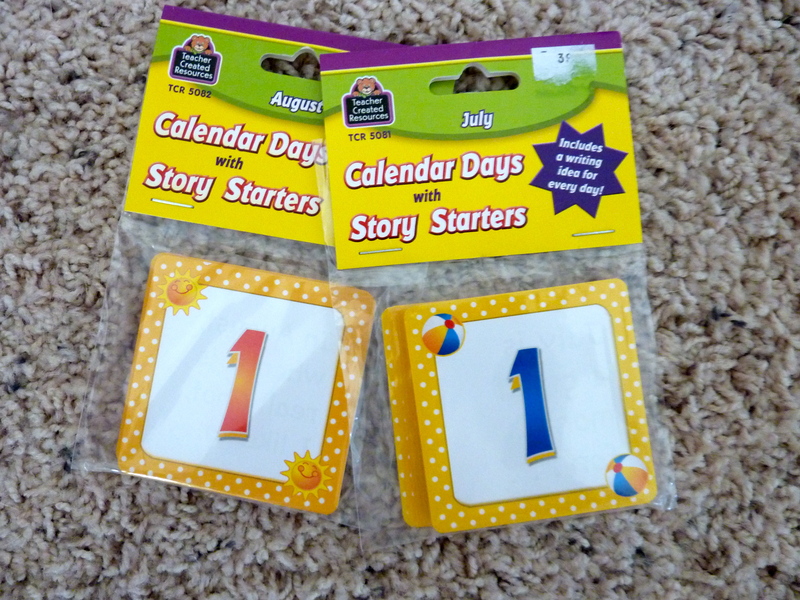 Each calendar number has a story starter on the back which makes them perfect for either independent journaling or writing together with your child on the computer, depending on what works best with your child. I am going to include this as a My Obstacle Course station activity to use with my laptop so we can write and print out the short stories or paragraphs that he comes up with. I probably won’t do this daily but will set out 3 or 4 numbers, have him choose a number and that will give us the story starter for that day. Something like this is difficult for Andrew (and lots of other children) since it requires him to think beyond what he is doing in the present moment so I’m not going to pair it with something else that he struggles with – handwriting. I am going to work with him, type as he talks, start sentences for him to finish, perhaps guide him back to the topic if he gets distracted or starts chatting about ceiling fans. (I can just hear his response to the story starter shown above – “I think people should take more time to…photograph and videotape their ceiling fans. It would be great for them to email them to me or post them on YouTube so I can watch them.” This really could be his response! I’ll let you know what he actually says 🙂 . If you have a child that can do something like this independently, I suggest allowing them to pick out a special summer journal notebook or if this is something that you will be helping them with on the computer, perhaps a binder that they can decorate. I think something as simple as this could make it more meaningful, especially if you have a reluctant writer. Andrew is always more motivated to do something if he gets to run to the printer to see his work printed out. We will definitely be decorating a binder for him to collect the work he does this summer! If your child has difficulties getting started with the writing process, go slowly! Work with them on brainstorming first, looking at the topic to see if there are any personal connections that they can make. Well, what do robots typically do? Help make work easier or do things that people don’t want or like to do. What are some things that you don’t like to do but have to do? Oh! Make your bed? Wash your hands? Brush your teeth? Put your clothes away? So, if you had your own robot that could do whatever you didn’t want to do, what would you have it do? This could be expanded to why they don’t like to do the task or what they could do with the time saved by not having to do what the robot does. It doesn’t have to be perfect! Just have fun with them, maybe share your responses with them. What is important is to encourage them to make connections and think about how to relate topics to themselves. After brainstorming, start out with encouraging them and helping them write a few sentences about the topic. From there, move to picking a sentence (topic sentence or main idea) that they can expand on or describe with more details to create a paragraph. Writing is difficult for many children and by progressing slowly and giving the process meaning within their own lives, they will begin to translate the process to things that maybe they don’t have personal experience with. Note: You don’t need these cards in order to do an activity like this. I just saw them and looked like they would be great for a My Obstacle Course station. You can make up your own or even google search story starters. When I did that, I found this Story Starter Machine from Scholastic. Pretty cool and free!